WOW does time fly! I can't believe that it is already September 24th - what a BUSY month!!! One of the things I always try and do is show you how it is that I color the Stamp of the Month, so that those who purchase the stamp or packet have a reference point. I did take progressive pictures once again as I colored this month's project back in AUGUST and I am finally getting around to sharing the details. Sorry for the huge delay. Once again I start with my lightest colors. In this case I used: Light Chartreuse, Sand, Scarlet Lake, Burnt Ochre and Sky Blue Light. Next I added accents of: Limepeel, Crimson Red, Chocolate, and Goldenrod and finally Dark Green, Olive Green, Crimson Lake, and Denim Blue. Last, but certainly not least is the fun shimmer and shine that the Spica Glitter pens provide. In this case I used Orange on the flames, Red on the berries, Clear on the roof and snow, and Melon on the wreathe. 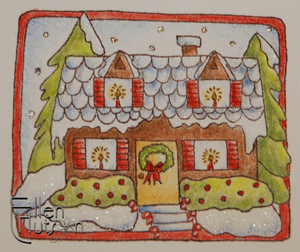 I then used the white Souffle pen to add highlights to the candy canes. 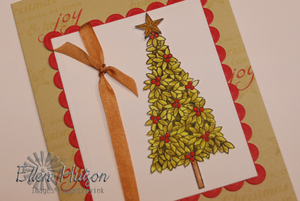 I selected a product that would be versatile as a background paper - the Memory Box Holiday Greetings paper collection even has an assortment of tags included that you can cut out and use on your projects. To complete the project I pulled out a wheel that has been sitting here waiting to be tried. I really like the effect that I was able to create with it. I think that any "tracing wheel" in your sewing kit would probably give a very similar effect to the drifts below. Simply run the tracing wheel across the entire length of your paper crossing over your pathway along the way. 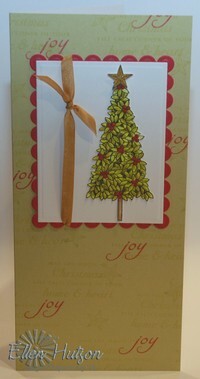 Simple layouts and the added touch of the brads and cut edge make this a quick and easy card to make. 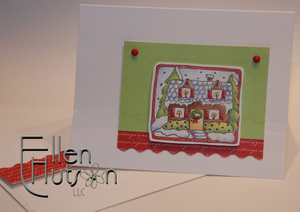 Adding a hint of the same paper to the back of the envelope adds to the cuteness factor of this little ensemble. the ever missing Copic markers are(hopefully) on their way soon. It was almost a "sit-down" meeting I had with Justin a few minutes ago. I said I needed MORE information - please - purty please with a cherry on top! So here is the skinny - "Ellen's" colors are in the warehouse - do you hear a big WOOHOO?!? But that doesn't do me any good until they put the sets in the wallets and cases and get them out the door to us. So I pushed for a more critical answer and learned that they have someone coming in to put them together tonight and tomorrow - here's to hoping that that individual is an organized and fast worker!!! With that shipment I can hopefully say that our "issues" with preorders will be ended. Now if all my competitors would just leave "Ellen" colors off their orders I would be a much happier camper - LOL! I kid you not - Copic is getting orders from others asking for "Ellen" colors - I didn't know I was so popular - teehee. I politely asked them to please ship Ellen her colors before they send off these colors to other places being that they are "my" colors - snort! I had no idea I would make such an impact in this little world of markers. 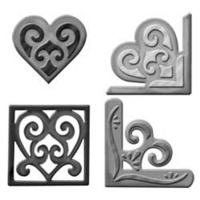 new colors - you have all been asking for Stampin' Up! colors. I am working on that. I know - I could just go and read what everyone else has selected as Stampin' Up! colors and use their list, but I have a very critical eye and I need to pick these colors all by myself if I'm going to attach my name to these. Am I just a little overzealous or commited to perfection in my books? - LOL! The one thing that I can honestly say is that I have always been know for my "eye for color". Through design school and when working as an interior designer my color memory and selection was always something that I took pride in perfecting. So once again you can be assured that I am going to test the colors that I think are correct before passing this information on to you. I thank you for your patience and support. Please know that once again I am going to be whittling the colors down until I find the best combination possible. Last but certainly not least in my books are shoes!!! Am I a goofball or what? I just had to take a picture of my feet for the memory books. The joy of putting on a PAIR of shoes - what a moment!!! Last week was a rough one for me. Walking with the boot on and not using crutches took a serious toll on my knee, hip and spine. DIfferent leg lengths is obviously not a "good thing". (Hmmm - I wonder what Martha would call it? Does she have a category for those not so good things in life?) By Friday I was absolutely miserable. So I made a rather bold move and set my boot (cast) aside and pulled out an old pair of tennis shoes. Getting my foot into that shoe was no picnic I tell ya, but I began to think it might be the lesser of two evils, so I just pushed it in there - LOL! I made my way to the shoe store and selected these shoes (the same shoe - only in a larger size to help make room for my still swollen foot :D) and now I am walking. OK - so it's baby steps, but I kid you not when I tell you that it is something I am extremely grateful for!!! WIth some help from Carrie I hope to put the additional knee and back aches to rest and get on with life. Thanks for hanging in there with me throughout this "life altering experience". Hopefully soon all the little "issues" will have been put to rest and life will just be easier :D.
We have some wonderful things up our sleeves, but only time will tell you what they are :wink: so hang tight for fun things to come. Now go get our your color pencils or markers and do a little coloring - relax - it will feel good!!! So I hear you girls were crashing the site again last night - LOL! I tried to join in the fun over on the Paper Trey forums as well and felt so badly for Nichole - sometimes computers just don't want to cooperate with us beginners. But as usualy Nichole thought fast on her feet and provided a fun party for you all on her blog. Thank goodness for our blogs - I know it has been a wonderful way for me to communicate with all of you in a pinch. Just a couple of quick product updates before I share close-ups and information on the projects I created for Paper Trey Ink this month. Secondly - you will notice that the Nestabilities in our store are mostly off of the Preorder status - yahoo!!!! Only one set is completely sold out and on preorder - the Oval, Classic Large. More of all product is on order and hopefully it will be here in less than two weeks. You will notice I did a little organizing today to try and get all the different Nestability shapes together better. So what do you think? Is it easier to see? I also added more links to each item to try and assist you in coordinating the items. Please never hesitate to contact us. We do our utmost to reply to each and every e-mail every day. If you do not hear from us in a timely manner then PLEASE resend your message. I kid you not when I tell you that we receive 100's of e-mails each day and so some of them get buried or go missing in our SPAM folder, or even never seem to arrive and must be floating out there in cyberspace. So if you haven't heard from us after a day - then please do not feel like your are bothering us, by resending your message! We are here to help. I know that the questions will arise with your new product and we will do our very best to answer those questions as quickly and thoroughly as possible. Sometimes it will be in a blog post, others it will be a personal email or phone call. Thanks for hanging in there with us through thick and thin! Paper Trey Ink has done it again. Their latest Holiday images were just wonderful to work with. Sometimes I feel that my ability to create is overpowered by the workload that is needing to be completed behind the scenes. It has also been frustrating for me that I haven't been able to get about to create as I did when I was on both feet, so I am very much looking forwards to a new lease on creating here again soon. I hope to get the stacks put away that have accumulated being that I was always begging for help - I find it empowering to have a clean space to work on and thus I find that my work is much neater and more precise when I have a "clean slate" so to speak. One of the first creations I attempted was using the Believe set. Nichole was worried about how it would be accepted being she doesn't "color". I assured her that I found it fabulous to color! She did such a fantastic job creating the tree so that adding depth would be simple. Below is a step by step on how I used my Copic markers to color in this image. It was so quick and easy! First I color my lightest colors - in this case I used YG00 as the base color for my tree leaves and YR21 for the berries. I find that when I use a golden shade with my red it gives a fun twist to the red colors upon completion. The other thing that I do at the very beginning of my coloring session is to determine where I want to place my colors - thus I cover my entire image with color determining where the green will be colored and also the red. This way I don't have to think so hard as I continue to work. My basic color placement is determined and these light colors are much easier to cover if I do make a mistake in my locating my colors. Next I added my green highlights. I selected a total of three greens for this project - YG00, YG95 and G99. I added YG95 to some of the leaf area and background spaces, as well as added G99 to all of the background spaces. As I colored I found areas that were not leaf shaped and just added the depth in those "corners". By balancing the dark areas across the tree from top to bottom I was able to easily create depth in the image. I worked quickly and once I had all the foliage colored I came back in with the YG00 and pressed the tip in to each leaf allowing the color to pool slightly - thus it easily blended the different colors that I had used. If you look closely you can see the difference at the top of the tree and the bottom. I added R27 and R29 to the berries. Instead of applying the color evenly across the berry I laid down the R27 (the lighter red) to the top right side of the berry and the R29 to the lower left. This helped to "round" the berry out. Last (but certainly not least - LOL) I added some gorgeous shimmer to each berry by using my orange Spica glitter pen. Why orange you might ask? I find again that by adding contrasting colors it truly makes the image come to life. I would like to suggest that the next time you create try practicing on a scrap sheet of paper and combine some "unusual" colors to see what they will look like when blended together. You may be pleasantly surprised. To complete the background the sentiment was stamped using Adirondack Willow ink on Memory Box Willow cardstock. This is an absolutely stunning green - so different from the typical greens. I just loved how it looked with the red accent word stamped in Colorbox Chalk Lipstick Red. I think I will begin a new post to describe the other projects I created being that this post is so lengthy. I certainly am being long winded once again - LOL! Today I took the time to review the compatibility sandwiches that I had posted back in July and I have updated the information to include the new Magnetic Placement Mat in the machines that I own to let you know how it will affect the sandwiches. I am happy to tell you that it will work in the Cuttlebug, but you will need an additional white spacer plate to accomodate for the added thickness. It will also work in the Big Shot with only slight modifications needed. I would like to suggest that you find your machine below and then copy and paste your needs to a Word document and print them out to reference when you use your new dies. The Magnetic Placement Mat is an ultra-thin layer, much thinner than the xyron magnetic pads I made to store my Spellbinders dies in. See this post for my storage examples. It is important to me that I always research any idea that hits my brain and so I did try those mats in my Wizard and found that they did indeed hold the dies in place. But after several uses the die shapes were "embedded" in the magnetic pad I had made. I don't know what the outcome of this will be after repeated use, but I wanted to let you know that initially this does work. Unfortunately the depth of my magnetic "creation" is too deep to use in other machines without creating significant snapping and popping. 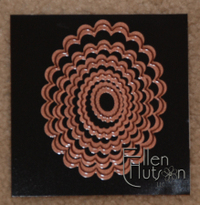 In comparison the Spellbinders Magnetic Placement Mat retains its original shape much better than my homemade version. One thing I did notice is that the Magnetic Placement Mat is larger in size than the White Spacer Plates. Therefore where the Magnetic Mat extends over the edge of the White Spacer Plate I made quit an indentation in my Mat right at the edge where it extended over the Plate. So I trimmed my Magnetic Placement Mat using my Carl Cutter to be the exact same size as my Spacer Plate - problem solved. In the following Compatibility Sandwiches the products listed below are referred to repeatedly - I thought I would link you to these items to help you gain a better understanding of what they are. All recipes are placed in stacking order starting at the bottom moving upwards. After cutting do not remove paper from die to emboss, proceed with paper remaining in die. This machine is capable of cutting and embossing any Spellbinders™ die. I can not guarantee that the B plates will not break in the Cuttlebug, but when testing my B plates were fine. They did make that ever present cracking noise though and therefore my hesitancy to say that they will never break being I have broken many B plates over the last few months. I do plan on testing the Spellbinders Thick White Mats and the Blue Mats included in the Wizard Charm Embossing Kits to see whether I can find an alternative to the acrylic plates. The white and blue mats provided by Spellbinders are so much sturdier. Well - perhaps that's a bit of an overstatement, but I just have to share my good news for the day. I'm WALKING!!! Now how elementary is that?!? LOL! I got the thumb's up today to walk without crutches!!! 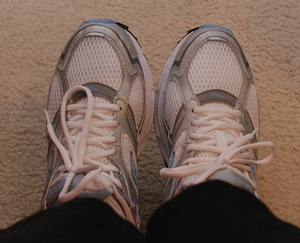 It's going to be a bit of a long-haul still, but I am SO thrilled to be on my feet again - literally! Can you tell I've been a little depraved? It just feels too unreal to finally be able to take my first baby steps. There is a LOT of healing yet to come - it appears that I might have a "floater" bone, so please, please, please say your prayers that it just goes to places in my foot that it doesn't irritate. Also I have something called "Morton's Neuroma", which essentially means that a nerve has become enlarged. Needless to say it doesn't feel good Ü We are hoping that it is going to be a "Morton's Neurightis" though - LOL! In doctor's terminology it was his joke that he is hoping it heals right and after 4-6 weeks it will just disappear. So please wish me luck as I continue this healing process. 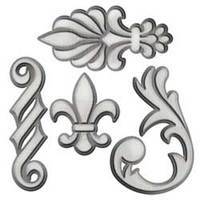 Another bit of good news is that we have made a HUGE dent in the Nestability orders. There are only a few left to go!!! We are working so hard at it. Last night it was after midnight when J.J. and I finally went to bed and tonight - well it's 11:15 and we are giving up - LOL! Talk about dedication - are we two crazy hoot owls or what?!? Well - I'm going to sign off for tonight with one last BIG tease - can I tell you that the latest Paper Trey release is going to blow your doors down? Get ready, get set, because tomorrow is GO! I had so much fun with these sets - once again they provided me with that creative release that doesn't really tie me in to "work". My mind just floats free and I get to create. My work isn't quite as polished as usual, being it's tough to get things done in the state I'm in - but I am thrilled with the concepts I'll be sharing on Nichole's behalf and hope that you can see yourself getting a new energized creative boost from the ideas that will be shared. 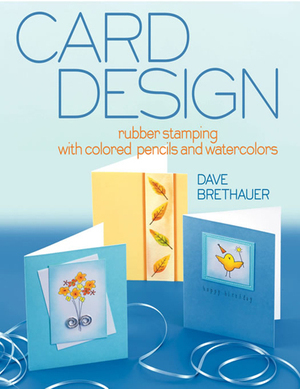 Announcing Card Design, by Dave Brethauer! Many of you know how important education is to me. I value it so much and it is so important to me that I share as much information with you as possible in regards to how-to's. So it is with GREAT excitement that I can finally share Dave Brethauer's latest achievement with you all!!! Dave is a colleague of mine who is SO very talented - he is the manufacturer of the Memory Box line of cardstock, papers, and rubber stamps. We carry his beautiful (and yes, I mean beautiful) assortment of papers in our online store. We now have in stock his new book Card Design and it is absolutely stunning. The color photography of the projects he has created are in one word - GORGEOUS! 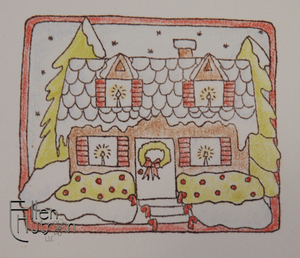 Included in the book he teaches colored-pencil basics of fading and blending of colors. He reviews color schemes, the use of color as pattern and experiments with different textural qualities. He then teaches watercolor basics showcasing watercolor markers, watercolor pencils, watercolor paints from a palette, and water-based inks as a palette. Then he moves in to one of my all time favorite subjects that I hope to share much more with you in the future when I get someone else to manage my webstore for me so that I can finally get back to what I love - education :D This subject is "DESIGN TECHNIQUES"!!! He reviews composition, pattern and color, texture. He works with chalks, transparent surfaces and sponging. Another fun little feature is that Dave has autographed each of the copies I currently have in stock and if I ask nicely I hope that he will continue to do so as we sell through these - I'm only guessing here, but when word gets out how inspirational this book is they are going to fly off the shelves! So get your copy now if you would like to color more like Dave. I know that I'm going to read my copy as soon as these Nestability orders all get out. We are still waiting for that Fed Ex truck, but we have been able to ship some of the orders that do not have the Stars or Petite Scallops. The remainder of all the orders is on that trucks so be assured that if you have placed a preorder they will go out as quickly as we can humanly get them out the door. If you find that an item is not showing in our store right now that will mean that we sold out of that particular grouping, but more are on order and we will do our very best to keep up with the demand. I am also going to work this evening to get the tan mats and the magnetic pads up on the site so that this information will be available. As you can probably guess I have had NO time to experiment with the magnetic pads that arrived late yesterday afternoon. Hopefully I'll be back with more information quickly!!! Thank you again for your amazing support and patience - you have no idea how much I appreciate each and every one of you who has hung in there with me! Hugs to you all! Yes, I actually have them!!! They will be arriving here on Wednesday. We are so excited to FINALLY be able to ship these out to you. Please know that we will give it our very best effort to get these shipped out to you this week!!! So much to do - so little time. Sorry for the lack of posts, but I am working hard to make certain that your orders will go out in a timely manner and correctly. I will do my best to get back here to post something inspirational though as well. Thank you once again for your continued support and patience - I am optimistic that you will find it well worth the LONG wait! Cheers!!! CONGRATULATIONS Tammy B!!! Please email me at ellenhutson@comcast.net with your snail mail addy and your telephone number :D You are now the new owner of the charming Spellbinders Cargo Alphabet!!! Tammy's quote just made me giggle being that I threw kisses every morning last year - LOL! and I hope to throw even more soon. One of my pleasures each morning last school year was walking hand in hand with Katrina to her bus stop and then cuddling her close in the breezy morning air. When the bus roars up we give a big hug and sweet little kiss good-bye and she climbs onto the bus and off to school she goes. BUT every morning she finds a seat where she can see me and begins blowing me kisses from her seat. I of course can't resist that sweet little face and blow kisses back, waving madly as she drives away. I kid you not when I tell you that I am looking forwards to that walk tomorrow morning - even though it will be on crutches. I missed the last two mornings with her daddy helping me get her off to school. So Tammy I thank you for the sweet memory and I actually look forwards to blowing kisses tomorrow morning - I guess I'd better tell Katrina so that I'm not disappointed should she not remember our little morning routine - LOL! Last night I mentioned that Marianne's piece of artwork had inspired me in one of my most recent creations. 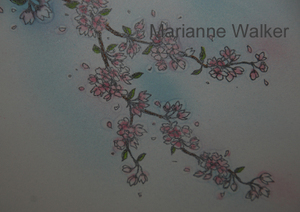 One of the most fascinating textures I spotted in Marianne's work was in the cherry blossoms she created. In thinking about how I would use these awesome little embellishments that Karen has created with her latest release I decided I wanted it to appear like the little outfit was hanging from this vine. 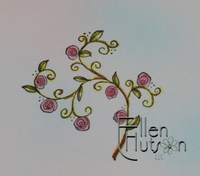 Following is how I created the rose vines. 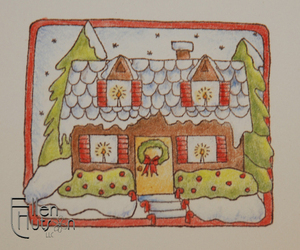 I stamped the image on Solar White cardstock using Adirondack Pitch Black. Using Copic markers (RV11, RV34, YG000, YG63, YG95 and E09) I colored in the image. As you can see I made no attempt at blending the colors at this point. In fact I wasn't even particularly careful in how I colored the image. I can't remember if I have shared a picture of the marker inserted in the airbrush previously and so I thought i would give you a quick closeup of the sketch marker installed in the air grip. It is so simple to place the marker into the air grip as shown and push it in until you feel it snap. You want the marker tip to be right at the end of the air nozzle to get the best spray pattern. If the marker is not fully engaged then the air is not directed at the correct spot and you will not achieve the best results. Being that I was trying to mimic the look of the sky that Marianne created above I choose not to spray an even pattern, but rather sprayed more randomly around the image, lifting and lowering the air grip to achieve some darker spots, as well as starting and stopping the air flow from time to time. I then pulled out my light blue marker (B00) and replaced it with the pink that I had used in the blooms (RV34). As I work I drop in to place the main image that I have colored to see how my background is "balancing" out my focal point. Here is a little tip (or secret) for you - at one point I felt that I had airbrushed too much blue on to my image, so I took my colorless blender marker and inserted it in to the airbrush. VOILA - it pulled back some of the bright spots that I had created with a magical effect. Once I felt that the colors I had airbrushed in place would balance with the focal point, I used the brush tip of my Sketch Colorless Blender Pen to "bleed" the colors together and create some "pools" around the flowers and leaves. It is these "pools" that I found so intriguing in Marianne's work above. I have yet to master it as she has, but it is a beginning and I love the soft look that it creates in the background. Again I remind you of the "squishy" tip I showed you yesterday - that is precisely the method I used on each on of these flowers and leaves. On some flowers I actually held the tip to the colored surface in three places and in others I only held it down in one, but pushed it in to the paper with a slightly heavier hand. To finish the background and focal piece I used the Nestabilities largest basic rectangle to emboss the background and the scalloped and basic oval to highlight the little "Sweet Pea" outfit. Last but certainly not least I added just a hint of bling to the flowers using my Spica pink and melon glitter pens. This little card has been created with a sweet little someone in mind - a precious new addition to this world. I can hardly wait to get it sent off, but alas I must wait to do a little shopping. Oh my, but it is hard staying home when you know that you need to go girl baby shopping - LOL! Hmm - one more week, or will it be two - please let me drive soon!!!! On a HUGE high note we have sent out the requests for the balance due payments on the Nestabilities. That's right ladies - we are madly working at this point in our attempt to make a huge dent in our shipments by the beginning of the coming week!!!! Some of the Nestabilities are on the road heading our direction as I type this. Hopefully by mid-week next week you will all have had your orders shipped and we will be able to take that large PREORDER category down and add the nestabilities as a regular feature in our store. I thank you so much for your excitement today and once again for your patience. I promise you that you will have GREAT fun exploring the limitless possibilities these will bring forth in your creations! I can also tell you that the magnetic plates and tan mats will be on their way here shortly as well. I have not yet put them up in my store being I have no pictures and not enough information regarding weight, etc. Please hang in there with me as we await the last details and I will upload that information promptly. Now that you have had a basic introduction to the airbrush system I want you to play with it and develop different ways of using it, but another question that seems to be pressing is "What on earth do I do with my blender marker and that colorless blending solution?" Hopefully tonight's post will share just enough to get your mind's racing and help you begin to explore the amazing things that can be done with these awesome tools. Do you remember how I used rubbing alcohol to clean up my "spray" mess? Well Joan B, you got it - rubbing alcohol can do amazing things to and with alcohol inks. If rubbing alcohol, which has a lower alcohol content, does cool things - then the real deal, colorless blending solution, will achieve even more striking effects. So let's begin! I'll begin with the texture on the left that is labeled rubbing alcohol (see second picture below). This first texture was created by wrapping a paper towel in a tight circle, applying rubbing alcohol to the end and then just lightly pressing it against the airbrushed paper. I opted to use a dark to light color progression so that you could get a fairly good vision of the effect that can be created. You can create so many types of effects just by using your creativity and a variety of textured products. Give this a try with burlap, cotton balls, linen - whatever you can dampen with alcohol you can use to change the texture of the surface colored with alcohol inks! The next line over was created using Colorless Blender Solution instead of rubbing alcohol. As you can see the more powerful strength of the Colorless Blender removes more color than the rubbing alcohol did. So depending upon the look you would like to achieve pick the solution that is best for that application. Another medium that Marianne shared with me that creates some wonderful "splotchy" effects when dotted in "globs" on your paper is Purell hand sanitizer. Now just watch the stock prices inflate on this stuff - LOL! I didn't have any on hand to show you the effect, but trust me - it is so worth trying. You can create these wonderful effects on "regular" colored work as well. I used the airbrushed example, being we had been talking about airbrushing and it was a quick and easy way to create a colored background to play with these different effects. Next I showed some incredibly simple texture ideas using the colorless blender marker. By placing the chisel tip side by side in a step by step progression you can easily construct a brick-like texture. The brush tip can be used to created symmetrical, even dots or pressed randomly and repetitively on your colored work to create unique textures. I also wanted to demonstrate the resilience of the brush tip. The first time Marianne showed me her "texturing" technique I caught my breath. If I had done this with my previous markers I would have never been able to color a small space with them again. Not the COPIC's :D Did I say resilient? These tips are so incredible! If I work for a prolonged period of time squishing the tip into my work, I then just "roll" the tip back out on a spare piece of paper and voila - back to it's perfect point. 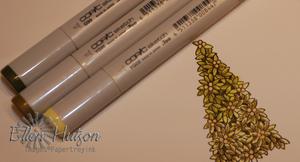 This is one of the features that helped me realize the quality materials these markers are made of. Next I played with some cool masking techniques. 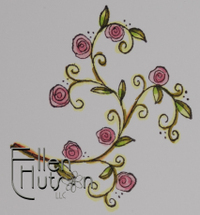 In creating for last month's Paper Trey release I airbrushed a flower similar to the one below. I used one of the hot new items in Nichole's store - the wonderful Maya Road sheer blooms. I really wanted to have a soft beautiful flower and so I pulled out my airbrush system to change it's color. The flower below was done in the exact same manner. What I realized in creating the project last month was that it created an awesome reverse image as well. Once again I used temporary adhesive to hold the flower in place. I then placed the flower on a sheet of white paper. 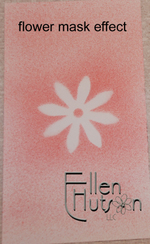 After airbrushing the flower, I removed it to expose the reverse image now on the cardstock. Next I experimented by wetting a paper towel with colorless blending solution and placed it over the image. Just imagine the variety of different masked and blended effects you can create. I am thinking that a collage would be wonderful to create - using different colors and different shapes, stamping, coloring - oooh la la - it's endless!!! I am now going to end with a delightful series of pictures. These were created by Marianne Walker who teaches many of us novices, for COPIC, here in the U.S. She is the one who has taught me so much about their product. As per usual I didn't think before I shot these pictures. I was so fascinated by the texture that she created in her coloring that I didn't think to capture these pieces in their entirety. Perhaps she will allow me the honor of taking better pictures at some point when we meet again. So without further ado may I present Marianne Walkers fabulous texture examples - please double click on the images for a larger, closeup view! Notice the beautiful bamboo texture created on the surface of these sandals. 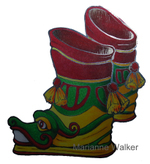 Once again the texture on these boots is fabulous - look closely. This last picture is my favorite. There are SO, SO many different textural areas in this piece of artwork that Marianne has created. I look at it for inspiration constantly - just studying the different areas and analyzing and wondering how it is that she has created the look simply with markers and only markers. I hope this little piece will inspire you to experiment! Experimentation is the key to unlocking the doors of your own creativity. Have no fear - just forge ahead! 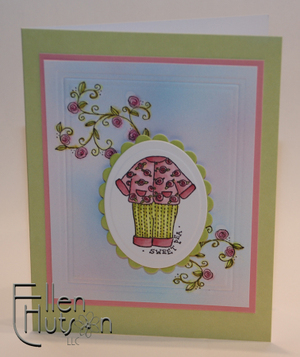 I'll be back to share a little card that I have created using the above picture to inspire my experimentation. Don't forget to add your words of wisdom to the previous post to be included in a drawing for the awesome Cargo alphabet! The deadline is tomorrow night! Happy creating!! !